Recorded at Array Space, April 12, 2018. 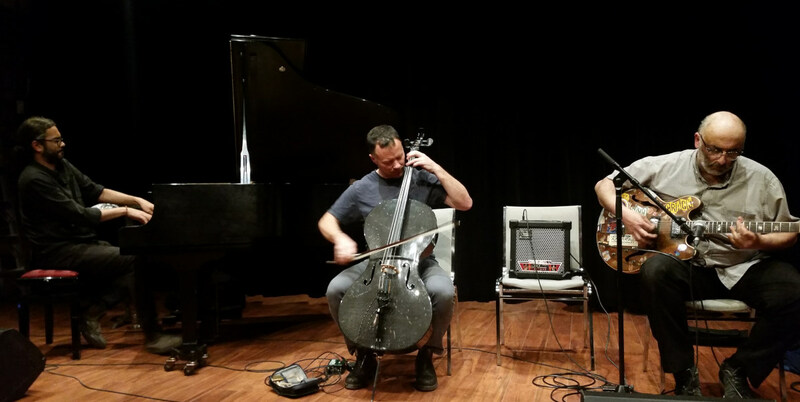 Given the geographical realities of our country and the economics of making creative music, it can be a too-rare occasion to see far-flung peers playing locally. This group, bringing together Halifax mainstays Tim Crofts and Norman Adams with Montréal's Sam Shalabi (Shalabi Effect, Land of Kush, etc.) 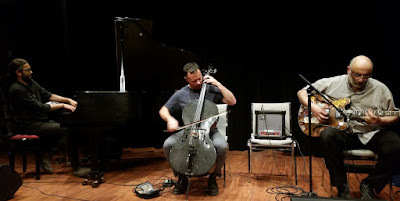 has geographical separation hardwired into its makeup, so it was a noteworthy to see them making their way across Canada, celebrating the release of a recording (which was, itself, a document of the trio's first on-stage encounter). Melding elements from each of their practices (including prepared piano plucks, contemporary classical cello chewing and post-punk guitar/Egyptian oud shredding) there was a tasty arc here, torquing parallel conversations into perpendicular pushing apart before falling back into a shared space.